Notify me by email when Edison robot V2.0 becomes available. At last educational robotics at a price your school can afford! Edison is well equipped with sensors and actuators for teaching educational robotics. 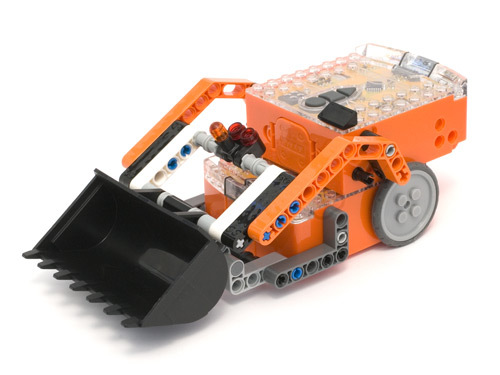 Edison has been designed as a modular robotics system that is easily expandable using LEGO®* Compatible bricks. New inventions are only limited by your student’s imagination! 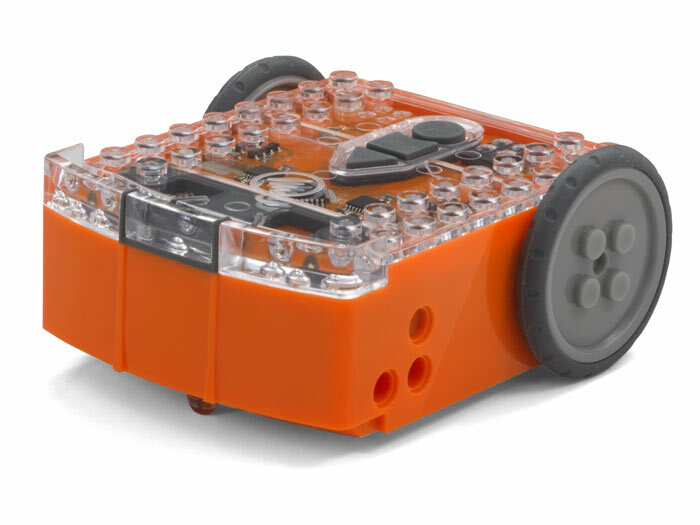 Getting your class started with the educational robotics is easy with these 10 FREE Educational Robotics Lesson Plans. Edison can be programmed from a growing number of FREE software applications. 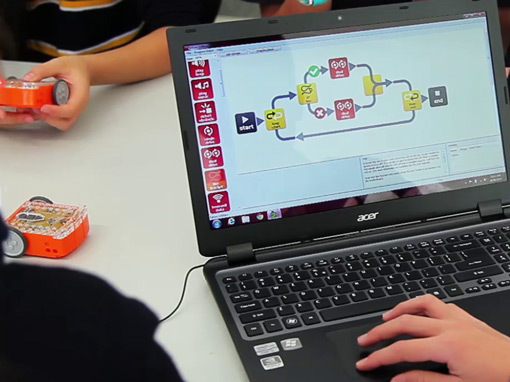 EdWare is graphical programming software that makes teaching educational robotics a breeze! 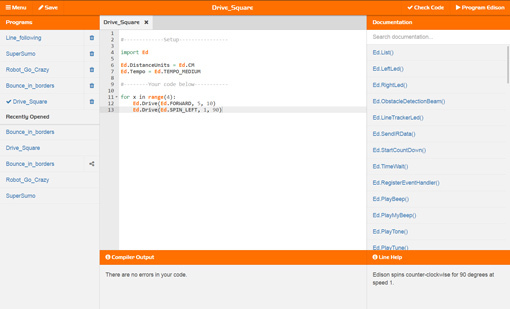 Using drag and drop graphical icons robot programming is easy to learn and great fun! EdWare is available for Windows, Mac, Linux, iOS (iPad) and Android. EdWare is FREE to download or use online. This easy to use drag and drop graphical programming language uses CONTROL, READ, DATA and FLOW instructions that are linked together in a logical flowchart style. Programs are downloaded using the supplied EdComm cable. 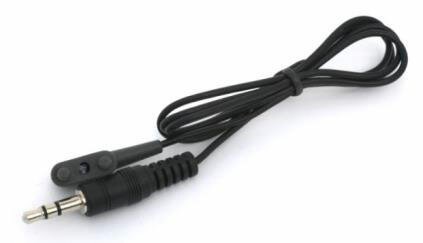 The EdComm cable connects to the headphone jack of your computer or tablet and uses a stream of pulse encoded audio to program Edison. EdWare is available for Windows, Mac, Linux, iOS (iPad), Android and Chrome and as an online app at www.EdWareApp.com. 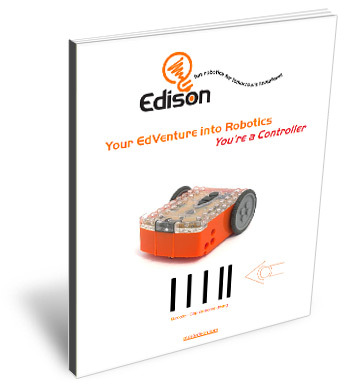 EdWare for the Edison robot is FREE to download and use. 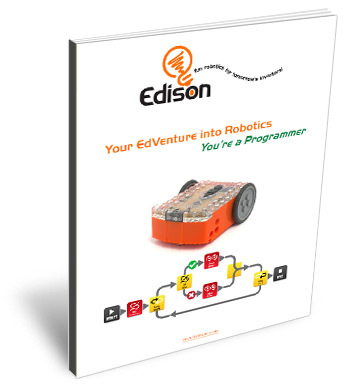 EdPy makes text-based programming fun, as students can see their code come to life in their Edison robot. Python is easy to learn, has high readability and is very popular. EdBlocks makes programming super easy for younger students with drag and drop graphical icons that click into place. EdBlocks is based on a convergence of Scratch and Blockly by MIT and Google. The release of EdBlocks is expected in the first half of 2017 and will be a FREE web app. Each Edison comes with an EdComm cable for downloading programs into Edison. There are three FREE to download EdBooks that introduce educational robotics. 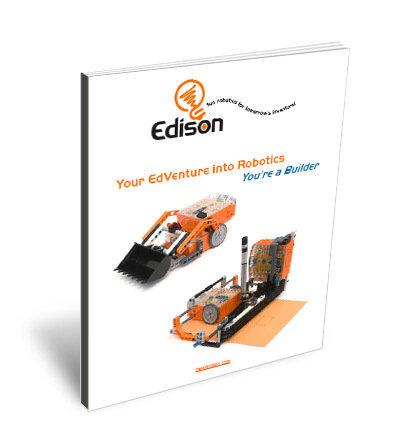 Each EdBook is fully illustrated and takes students through the three main concepts of controlling, programming and building robots. In addition, an A1 size educational robotics activity mat is free to download. 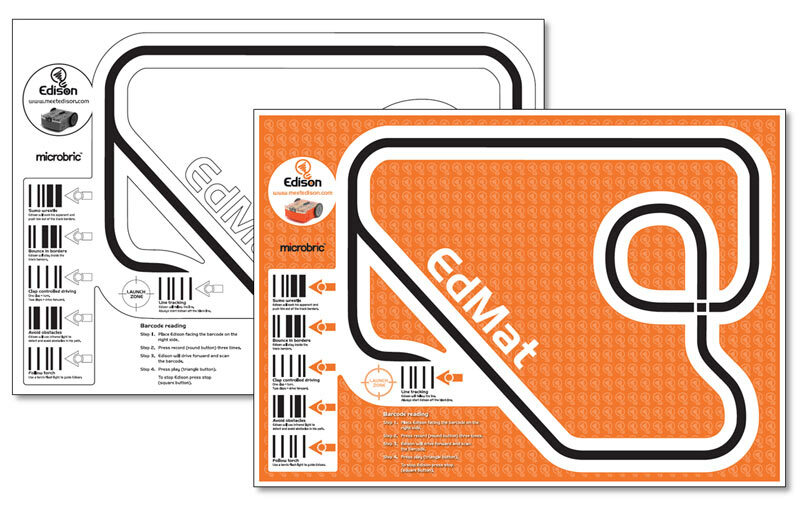 The EdMat is an A1 size (59cm x 84cm) (23.2in x 33.1in) educational robotics activity mat that can be printed at your local print shop. The EdMat has 6 barcodes that activate Edison’s pre-programmed features and a track for Edison to follow. The track can also be used for ‘bounce in borders’ and ‘sumo wrestling’. There are two versions colour and black and white. The team at Pakronics is very helpful and they provide genuine advice of the products. My 8 years old daughter can program the robot easily by following the instructions listed on the internet but there're 2 things I would like to point out are firstly, the instructions for showing how to connect the robot to the computer is not shown in details just says connect the robot to the programming device, I had to do a search on the internet to find out which connector on the computer that the robot can be connected to. Secondly, the block programming is very easy to be followed but it took quite a while to download the block programming to the robot so long that we unplugged the robot from the computer before the download was completed and the instruction does not say how long it will take. The instructions online should be rewritten for the above mentioned 2 points. That's my humble opinions. Thank you and please keep up the good work. Having fun with this robot. My 13 year old son asked for this for his birthday as he was using these at school and was keen to play around with it at home. Now his brother wants one! super fast turnaround time, thank you!